A fatigue failure caused the left hand main landing gear on an ATR-42 to collapse on landing at Jersey Airport, U.K., an AAIB investigation revealed. 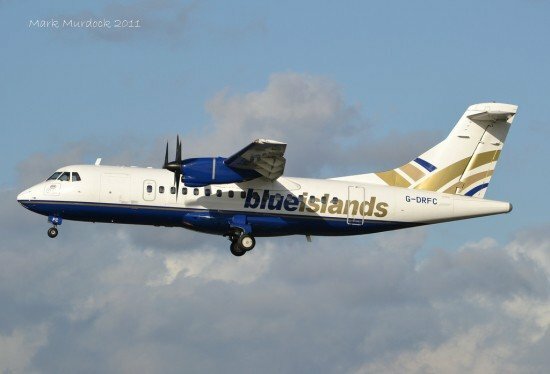 On June 16, 2012, Blue Islands flight SI-308 operated a service between the Channel Islands of Guernsey and Jersey. There were 40 passengers on board and three crew members. The captain was pilot flying. He was conducting line training of the co-pilot, a first officer who had recently joined the company. The airplane operating the flight was ATR-42-320 G-DRFC, built in 1986. The short flight to Jersey was without incident and the weather for landing was reported as good, with the wind from 210° at 16 kt, few clouds at 2,000 ft and visibility in excess of 10 km. The commander elected to carry out a visual approach to runway 27 at Jersey, using a planned approach speed of 107 kt and flap 30 selected for landing. During the approach, the gear was selected down and the flight crew confirmed the three green ‘gear safe’ indication lights were illuminated, indicating that the gear was locked in the down position. The commander reported that both the approach and touchdown seemed normal, with the crosswind from the left resulting in the left main gear touching first. Just after touchdown both pilots heard a noise and the aircraft appeared to settle slightly differently from usual. The captain considered that a tyre had burst. The cabin crewmember also heard a noise after touchdown which she too thought was from a tyre bursting. The commander selected ground idle and partial reverse pitch and, as the aircraft decelerated through 70 kt, the co-pilot took over control of the ailerons, as per standard procedures, to allow the commander to take control of the steering tiller. Despite applying corrective inputs the aircraft continued rolling to the left. The aircraft continued to quickly roll to the left until the left wingtip and propeller contacted the runway. The aircraft remained on the runway, rapidly coming to a halt to the left of the centreline. Both propellers continued to rotate and the commander selected the condition levers to the fuel shutoff position and pulled the fire handles to shut both engines down. 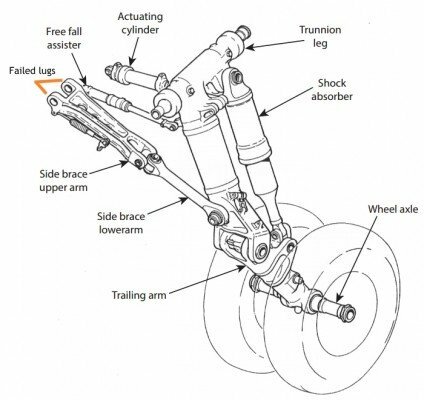 It was determined that the left side brace upper arm had suffered a fatigue failure. The failure rendered the side brace ineffective and the unrestrained main trunnion continued to translate outboard, leading to the collapse of the gear. The aluminium brace was found to contain a small metallurgical feature at the crack origin which was consistent with titanium rich particles (TiB2) particles which are introduced as a grain refiner during casting of the billet prior to forging. The size of the feature was within the defined specifications for AL7010-T74. Analysis of the area surrounding the crack origin revealed an area of static loading before propagating a crack in fatigue, indicating that there may have been a single overload event at some point in the history of the side brace upper arm.